duoMatrix™-G Product Information | Smooth-On, Inc. Specific Volume 17.45 cu. in./lb. duoMatrix™-G is a new three component polymer additive system that greatly enhances the physical properties of alpha gypsum products duoMatrix™-G (Matrix-G™ for short) reduces the demold and drying time of gypsum and drastically reduces water permeability making it suitable for both interior and exterior applications (for exterior use, product must be sealed – see “post finishing” section). Matrix™-G has less odor and yields elements that are a brighter white than competing products. Easy to use and can be cast solid, laid up by hand with chopped fiber or sprayed. Fully cured pieces can be painted, sanded, machined and polished. Used to make lightweight pieces that are very strong and water-resistant. Applications include making architectural elements, reproducing sculpture and special effects. Vibrant colors are possible by adding pigments. Metal powders (bronze, pewter, brass, etc.) can be added to give the look of real metal castings at a fraction of the cost. 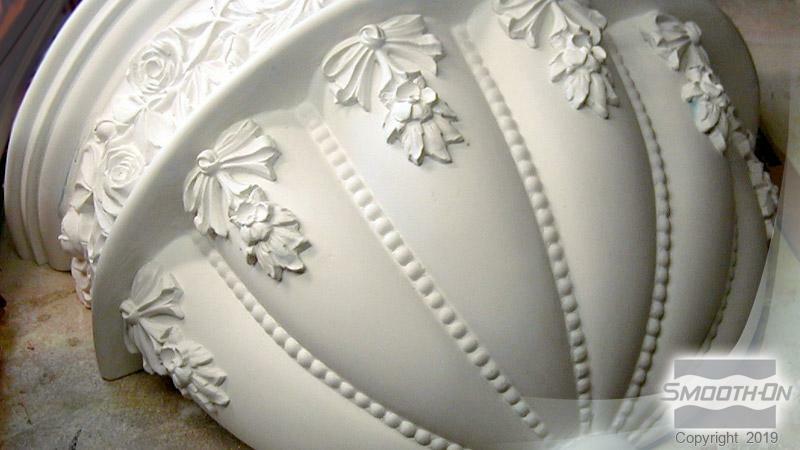 You can duplicate the look of marble or ceramic by adding inexpensive fillers. 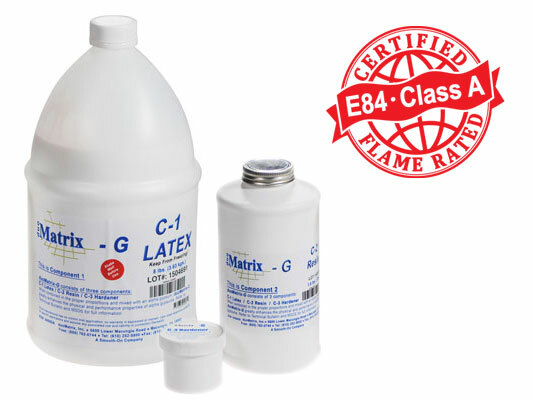 When used with United States FGR 95 Alpha Gypsum, Matrix™-G has received a flame rating of UL-94V-O and meets ASTM E-84, Class A (or 1) flame rating for building materials, which means this product meets the highest standards for both flame and smoke. Product may freeze in transit – order may be delayed due to freezing temperatures. Safety - Store and use at room temperature (73°F/23°C). These products have a limited shelf life and should be used as soon as possible. Colder temperatures will slow the working/ cure time, while warmer temperatures will reduce working times. Individual components should be stored in a dry environment at room temperature. Humid conditions will cause plaster and resin to lose effectiveness. Do not let latex (C1) freeze. Wear safety glasses, long sleeves and rubber gloves to minimize contamination risk. Mold Preparation - If casting into a urethane rubber mold, first apply a release agent such as Universal™ Mold Release or Ease Release™ 200. If using a silicone rubber mold (Mold Max™ Silicone), the rubber does not require any advance preparation. 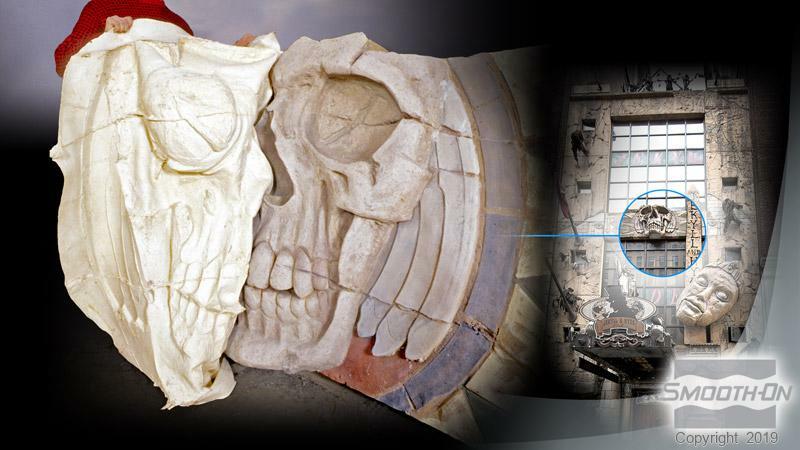 Matrix Components - The Matrix™-G base system consists of 3 components (C1 + C2 + C3) that are blended with an alpha gypsum. Component 1 (C-1) Latex: A white liquid that acts as a binder and gives dMG water resistant properties. Component 2 (C-2) Resin: Fine white powder that reacts with component 3 and the Gypsum. Enhances physical properties of overall mix. Component 3 (C-3) Hardener: Crystalline Powder - looks like sugar. Different levels will affect working / demold time. Alpha Gypsum: You can not use just any gypsum/plaster product. You must use an Alpha Gypsum such as FGR 95 from USG Corp., Densite HL from Georgia Pacific, Crystacal R from British Gypsum or equivalent. Important: Use only fresh materials…old materials (plaster, latex) will give inconsistent results. Measuring and Mixing - To minimize dust inhalation, we recommend that you wear a NIOSH approved dust mask while weighing and mixing components. An accurate scale (gram scale or triple beam balance) is required to be successful with this product. Do not use a postal, dietary or bathroom scale to weigh components. Important: Components must be mixed in proper sequence. A power mixer should be used to mix all components. Step 1: Shake or Stir C-1 Latex Well, And Dispense Required Amount Into Mixing Container. Step 2: Combine All Dry Ingredients: Combine gypsum + C-2 Resin + C-3 Hardener by weight into a suitable size mixing container (If adding fillers such as chopped glass, bronze powder, dry pigment, etc., blend with dry components before adding C-1 Latex). Mix dry components thoroughly with mixing paddle, power mixer, etc. until well blended. Step 3: Sift powder contents into C-1 Latex and mix all components with a power mixer until all dry powder components are thoroughly dispersed (minimum 90 seconds). Component amounts will vary depending on the size of the batch you are making. Accelerating Matrix™-G - Matrix™-G Accelerator (powder) will reduce the demold time of Matrix™-G and should be pre-mixed with dry components before adding latex. Note: The shorter the desired demold time, the shorter the working time. Slowing Matrix™-G: Some applications may call for a large quantity to be mixed and poured in a single mold (mass casting) or for “master batching” (a large amount is mixed and poured into many different molds for production casting). Reducing Matrix™-G Hardener (C-3) will give a longer working time and demold time. 1. Brush a face coat of Matrix™ onto the surface of the mold. This helps to break surface tension and ultimately reduce air bubbles. 2. After a face coat is applied, the remaining mixture is slowly poured through a window screen, kitchen colander or equivalent into the mold. This will help eliminate any unmixed product and help to further reduce entrapped air. Further Reducing Entrapped Air - Air bubbles are sometimes a concern with polymer modified gypsums and will vary depending on conditions. There are additional steps you can take to help reduce entrapped air: 1. Vibrating – concrete casters often vibrate their concrete mixtures on a vibration table to reduce entrapped air. By vibrating the mold, air will rise and dissipate on the surface. 2. Pressure – Required: Pressure Vessel and Compressor. After mixture is poured into mold, place mold in a pressure vessel and subject mixture to 60 PSI (4.2 kg/cm2 ) air pressure for one hour. Pressure casting is the only way to completely eliminate bubbles from your mix. Vacuuming material does not work. 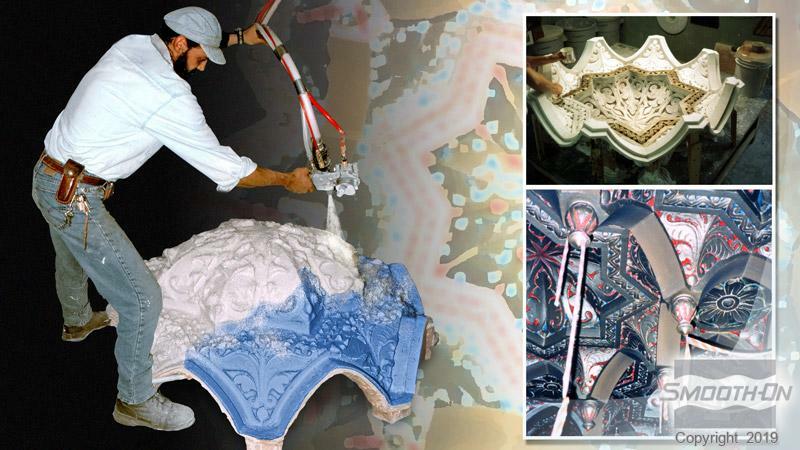 Making Architectural Elements – Hand Lay-Up Technique - Matrix™-G can be used to make architectural elements— both interior and exterior. With the addition of glass fibers in the form of fiberglass matting or chopped fibers, Matrix™-G can be “layed up” to make elements that are thin, lightweight and exceptionally strong. For exterior use, applying a sealer or painting the element is recommended. Fiberglass Surface Matting (i.e. SURMAT from Nico Fibers, Inc.) is most commonly used for making large architectural panels. Chopped fiberglass (i.e. 1/2” strand from Nippon Electric or Cem-fil) is used for making smaller elements. Hand Lay Up Using Fiberglass Matting - Mix Matrix™-G at the “standard” mix ratio and brush a surface or “gel” coat into a mold. Let cure one hour or until Matrix™-G gels (gel coat can be accelerated with the addition of accelerator). Mix another batch and brush a layer over initial gel coat. Lay matting over fresh material and let material penetrate matting—brush with clean paint brush and apply light pressure over surface to minimize entrapped air. After a uniform coating is attained, apply another layer of matting and brush again. Apply a minimal amount of Matrix™-G—just enough to wet out the surface. Repeat as necessary until 3/8” (1 cm.) thickness is attained. The number of matting layers will vary according to matting thickness. For example, if using 10 mil. matting, 15 layers are necessary to build a suitable thickness (3/8” – 1 cm). Hand Lay Up Technique Using Chopped Glass - Another technique for making strong, lightweight elements is to mix chopped fiber directly into the Matrix™-G standard mix. Generally, ¾” “AR” grade chopped fiber works best. “E” grade can also be used. Adding chopped fiber takes much less time than layering chopped matte. How To Proceed - The chopped fiber is added as a percentage of the total weight. Fiber can be added in concentrations of 3% to 12%. For best results, 6% chopped fiber should be added. Mix Matrix™-G at the “standard” mix ratio and brush a surface or “gel” coat into mold. Let cure one hour or until material gels. Next, calculate required total weight of Matrix™-G (C-1 + C-2 + C-3 + Gypsum). Required amount of chopped fiber will be 6% of this amount. Add chopped fiber to dry components (C-2 + C-3 + Gypsum) and mix thoroughly. Add C-1 Latex and mix thoroughly again with power mixer. Apply mixture with gloved hand or spatula over gel coat. Another application may be required to attain 3/8” (1 cm) thickness. Spraying duoMatrix-G™ - For making large architectural panels or for covering large areas, Matrix™-G can be sprayed using standard spray equipment (normally used to spray cementitious materials). Matrix™-G is mixed at its standard mix ratio with chopped glass and is then poured into the spray gun “hopper” where it is then forced through the spray equipment and out the spray nozzle. Post Finishing - After elements have fully cured, they can be sanded or sand blasted to achieve the desired surface texture. “Wet Sanding” is advisable to minimize dust particles and build up on sand paper. For Exterior Use, Apply A Sealer - Because Matrix-G™ system substantially reduces the water absorption rate (0.25%) of alpha gypsums, elements made with Matrix-G™ are suitable for exterior use. Elements must, however, be sealed with a suitable siloxane sealer such as Prosoco brand (prosoco.com) or Thoroseal brand (thoroproducts.com) concrete and masonry sealer. Elements can also be painted with an outdoor acrylic brand sealer paint. 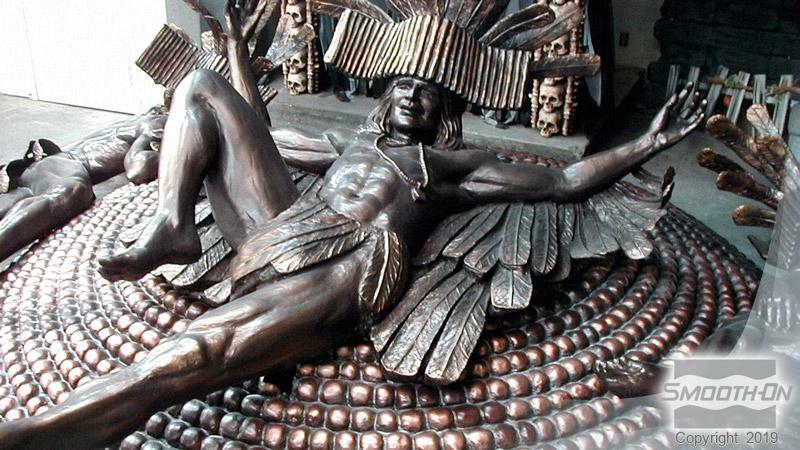 Making “Cold Cast Bronze” Elements - Reproducing the look of bronze is a common application for Matrix™-G because you can achieve the look of real bronze at a fraction of the cost. For making solid castings, the following proportions will work well. 325 mesh bronze powder is recommended and should be pre-mixed with dry Matrix™-G components prior to adding C-1 Latex. **Powdered Pigment – Adding a dark pigment (black or dark brown) to the dry mix will give the final casting added definition and dimension. Note: Powdered iron oxide pigments work best with gypsum products. Use 50 parts latex for a brush-on consistency and 70 parts latex for pourable consistency. Metal powders (bronze, copper and brass) are available from Smooth-On or your Smooth-On distributor. Post Finishing Cold Cast Bronze Elements - To bring forth the metallic finish, buff with steel wool or sand paper (400 grit). Patina coloring can then be done using cupric nitrate (green) or ferric nitrate (yellow). Casting should then be sealed with wax or clear acrylic spray to prevent oxidation. Adding Pigments And Fillers - Because Matrix™-G blends easily with different materials, realistic effects can be achieved with the addition of various pigments and/or fillers. Liquid or dry pigments can be added during mixing. Other metal powders can be added to attain specific metal finishes (copper, pewter, silver). 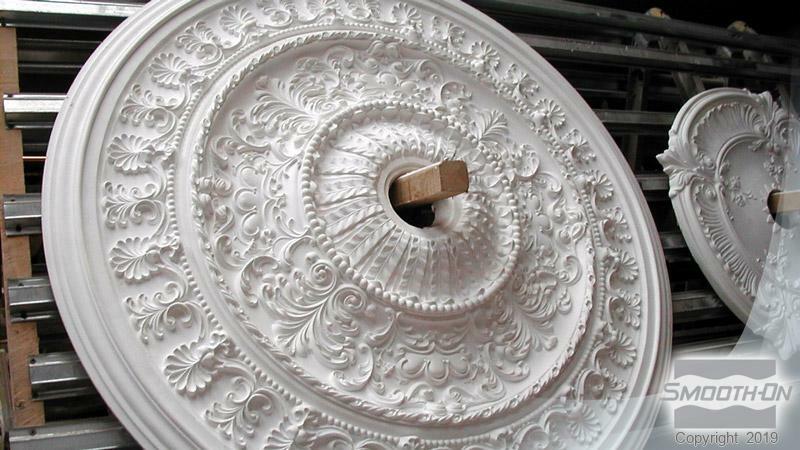 A marble finish can be attained by adding marble dust (calcium carbonate), 150 parts by weight to original mix formula. Granite crystals will give a granite look. Adding malachite will give a realistic porcelain finish. Wood grain finishes can be attained by adding powdered pecan shells or similar fillers. Metal powders and fillers are pre-mixed with dry components by weight. Amount of filler to be added depends on desired effect. Some experimentation may be necessary.